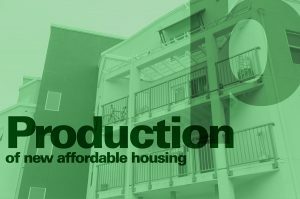 In the face of these obstacles, production of sufficient housing affordable to the low- and moderate income will require a major resurgence of political will and collective vision. Some of the policies discussed below offer a way forward. 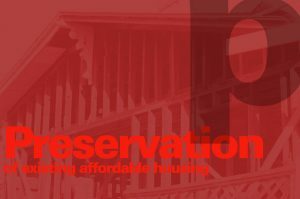 The most important and largest scale form of affordable housing provision has been government subsidized “public” or “social housing.” While under attack since the 1970s, this remains a vital source of housing, and movements have emerged across the country to both protect what exists and to advocate for increased public spending. The movement People’s Action and Homes for All advocate for a massive reinvestment in the budget for the Department of Housing and Urban Development (HUD) to meet 100 percent of need. Other cities around the world accomplish this: Vienna houses 60% of its residents; Singapore 90%. Its worth exploring how they do this, and the broad social benefits they experience as a result. Housing trust funds are established sources of funding for affordable housing construction and other related purposes created by governments. Housing Trust Funds (HTF) began as a way of funding affordable housing in the late 1970s, after the moratorium on funding for new public housing was introduced. Since then, elected government officials from all levels of government (national, state, county and local) in the U.S. have established HTFs to support the construction, acquisition, and preservation of affordable housing and related services to meet the housing needs of low-income households. Ideally, HTFs are funded through dedicated revenues like real estate transfer taxes or document recording fees to ensure a steady stream of funding rather than being dependent on regular budget processes. As of 2016, 400 state, local and county trust funds existed across the U.S. 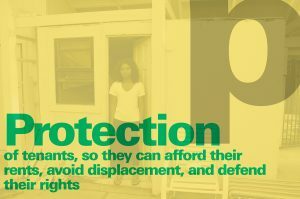 The housing choice voucher program — aka Section 8—is “the federal government's major program for assisting very low-income families, the elderly, and the disabled to afford decent, safe, and sanitary housing in the private market.” Housing choice vouchers are administered locally by public housing agencies (PHAs). The PHAs receive federal funds from the U.S. Department of Housing and Urban Development (HUD) to administer the voucher program. Voucher holders can choose any housing that meets the requirements of the program and is not limited to units located in subsidized housing projects. However, many landlords refuse to accept Section 8 tenants, while insufficient supply of landlords accepting vouchers is the norm across most U.S. cities and counties. In Santa Cruz, the waitlist for voucher holders is 17000 people long. Thus there is a case to be made to try to enlist more landlords into the program as well as to increase the fair market rent threshold in markets with escalating rents. Affordable housing impact/linkage fees are charges on developers of new market-rate, residential developments. They are based on the square footage or number of units in the developments and are used to develop or preserve affordable housing. Commercial linkage fees are charges on developers per square foot of new commercial development. Revenues are used to develop or preserve affordable housing. Density bonuses allow developers of market-rate housing to build higher-density housing, in exchange for having a certain portion of their units offered at affordable prices. In this inventory, we only include a city as having this policy if they allow an additional density bonus beyond that mandated by the state of California. Agree to house additional students and employees. Taking inspiration from the MOU between UC Davis and Yolo County, we support UCSC agreeing to house 100% of all new students, as well as to meet 100% of demand for new employee housing, or face a per-unit fine that goes into a housing fund. Build more affordable student housing. Student Housing West is underway. This could be expanded by developing the 2300 Delaware site, which we consider to be the most promising option for new housing—ecologically, economically, and in terms of convenience. Currently dominated by low-rise office buildings and parking lots, this large site could accommodate denser, taller, greener development dedicated to state-of-the-art student housing. The fact that it is a flat infill site, and can make use of existing infrastructure, can help bring down costs. It is well situated on bus lines, bike lanes, and in proximity to the Long Marine Lab, main campus, new commercial development, and open space. Bring down student housing costs. Expand funds to support students struggling with housing costs. The Division of Student Success could launch a Giving Day campaign, and seek other sources of funding from donors and through the development office, to help subsidize student housing and mealplan needs. The campus could increase the emergency loan budget, Slug Support, and support for housing within its "Basic Needs" initiatives. Advocate for long term solutions. The university and community can work together, locally and statewide for longer-term solutions. These should respect the needs of local communities in which campuses are based, limit future enrollment increases, and bring an end to unfunded mandates for enrollment growth. Specific goals could include a statewide bond measure and support for state leadership —from the legislature to the governor— who are commit to increasing funding for higher education and student housing needs—including for the UC, CSU and community colleges. Compare our policies to those of other bay area locations using The Urban Displacement Project at UC Berkeley's interactive map. Bryce Covert, “The Deep, Uniquely American Roots of Our Affordable-Housing Crisis.” The Nation, May 24, 2018. Alex F. Schwartz, Housing Policy in the United States. Third Edition. New York: Routledge, 2015. Betsy Wilson interview, No Place Like Home, April 2018. Karen Chapple and Miriam Zuk, “Housing Production, Filtering and Displacement: Untangling the Relationships.” Berkeley IGS: Research Brief. May 2016.